Last Friday morning, my husband was sitting in our basement working on the computer. He heard a noise and found out that there was something in our wood stove. At first, he thought maybe it was a bat or a bird. He told me about it, and I told him to leave it in there if it was a bat. He said that it sounded more like a bird, and I agreed that we couldn't leave it in there. So, he got the fishing net and carefully (and quickly) opened the door on the stove. He was pretty nervous to open it, because he didn't know what was going to come out at him. After looking in there a minute, he realized that a DUCK was in there! Crazy!!! How in the world did a duck get in our wood stove? How did it get through the small hole through the vent? We were much surprised. He put the net into the stove, got the duck in there, and pulled it out. Well, the duck flew out of the net and headed to the nearest window (which was closed). She was flapping her wings and hitting against the window. Finally, after a few tries, my husband got the duck back in the net and ran for the sliding doors (which we had open). He set the net down, and the duck waddled out and flew away. I am glad that my husband heard her in our stove and got her out. She must have been terrified! We are still just flabbergasted that a duck was in our stove!! CRAZY!! I can't believe that a bird was on her head! Crazy, Crazy!! Madelyn was a bit nervous, and she laughed a little, then she asked if I could take it off. 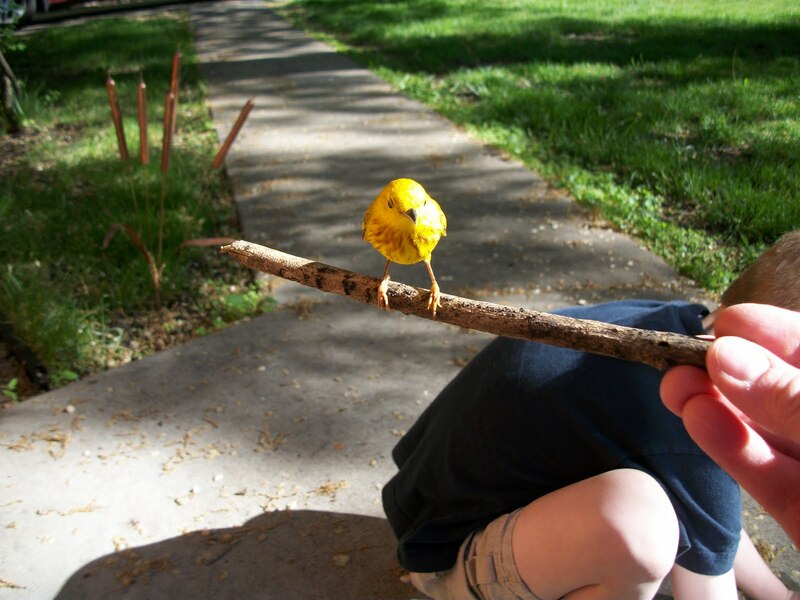 I picked up a stick and tried to put the stick near the feet so that it would walk onto the stick. However, that little bird just clung on to her hair even tighter. 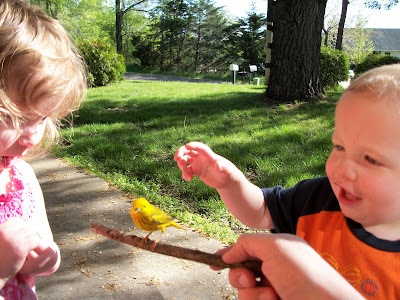 The little yellow bird had found a new friend. 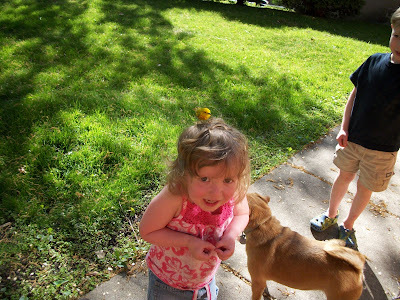 So, I asked Madelyn to wait just a second so I could grab my camera. I knew I had to take advantage of this amazing photo opportunity! I missed taking a picture of the duck in our stove, I wasn't going to miss this! The little bird held on her hair for quite sometime. I took a few pictures, and got the little bird to get onto the stick. After the bird was on the stick, it held on to that for awhile, too. Cole, my little guy was sitting in his high chair inside the house, and he wanted to come out, so I put the stick on the step. I asked Caleb to hold on the stick so it didn't roll away. When I came out with Cole, Caleb was holding the stick up. I wish I had a picture of that. because it was so neat! I had to take a video of the bird so I had proof that this was an actual live bird! 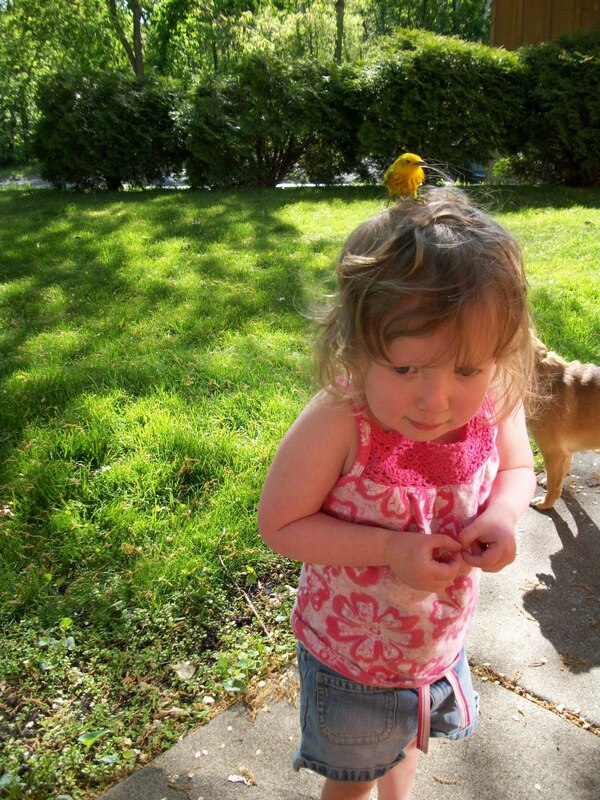 I don't know if the bird was a baby, or it was just a little stunned from maybe running into something. I do know that it wasn't afraid of me or the kids at all. It was just the craziest thing. It is such a cute bird. And I thought crazy stuff happens at my house. We only get turkeys, coyotes, and fox in Boston not crazy birds. Unbelievable! Do you know what kind of bird it is? 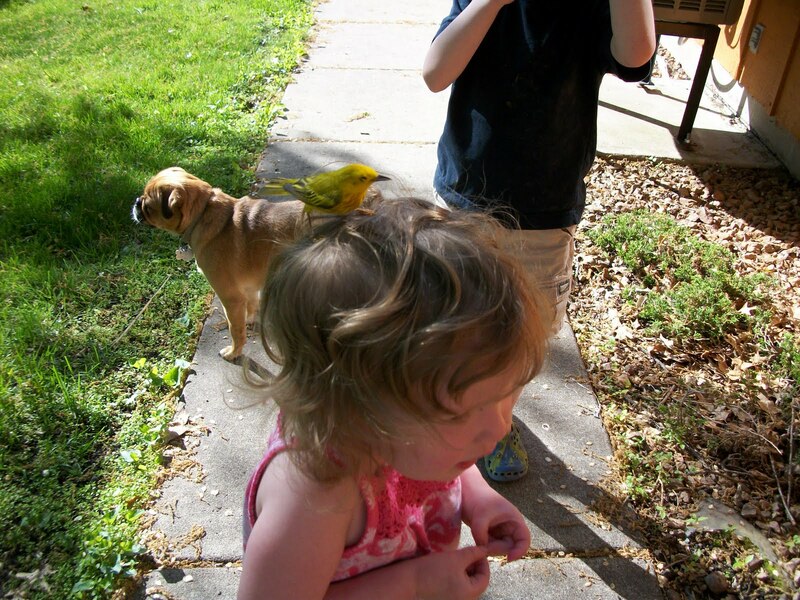 Do you think maybe it was someone's pet bird, since it wasn't afraid of people?? I'm thinking you can add these pics of Maddie up on your wall with the one of Nathaniel and "his" bird. That would be cute...and next time you have a duck in your woodstove...make sure you take pictures!! I'm glad you finally got the bird off of her head, and glad you finally posted the story so I don't have to keep secrets, lol. 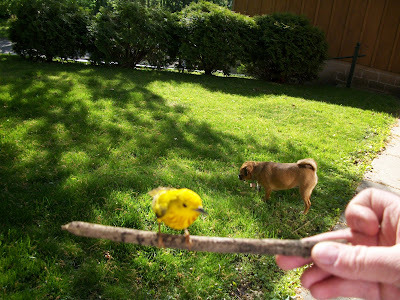 Ok, I just looked it up, I THINK it's a Yellow Warbler...so it's probably NOT someone's pet.